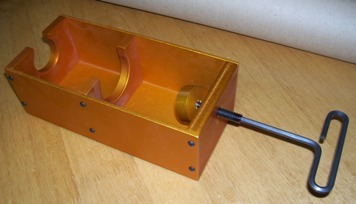 A tool designed to hold and compress both the main (pressure) screen, and the scavenge screen (if equipped) on many Wright engines, including the R-1820. This tool comes in a kit bag complete with snap-ring pliers. A handy compact wrench to fit the push rod tube gland nuts on Wright engines equipped with such. Double ended with teeth “staggered” to assist in those tight spots. This wrench replaces the extinct Wright 804964 and 804965 wrenches. 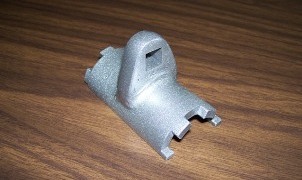 Anyone that has tried to put the fairings on a NAA Aircraft with off the shelf Tinnerman washers knows that the No. 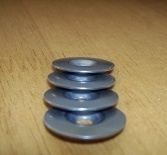 8 Tinnerman washers just does not look or fit right and, a No. 8 screw in a 10 washer looks terrible ! So, . . .Bob Grant, long time N.A.A. Guru and all around good guy, made stainless steel washers that look and fit better than the original shake-proof units. Basically,they are a No. 10 size Tinnerman washer with a dimple for a No. 8 screw. They were out of production for a while, but they are coming back! 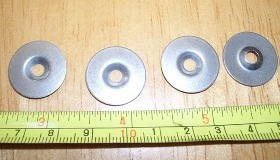 If you have a North American Aircraft, you need these washers ! Don't see YOUR aircraft? We can custom build a kit for you.